After 46 days, Kim Young-oh ends his protest in hospital, asks for "help". The response was immediate: in a few hours, 250 people went on a hunger strike in his place. Meanwhile, political leaders seem unable to act. A meeting between political parties and victims' families produced nothing. Card Yeom is criticised for his appeal to stop wasting energy. 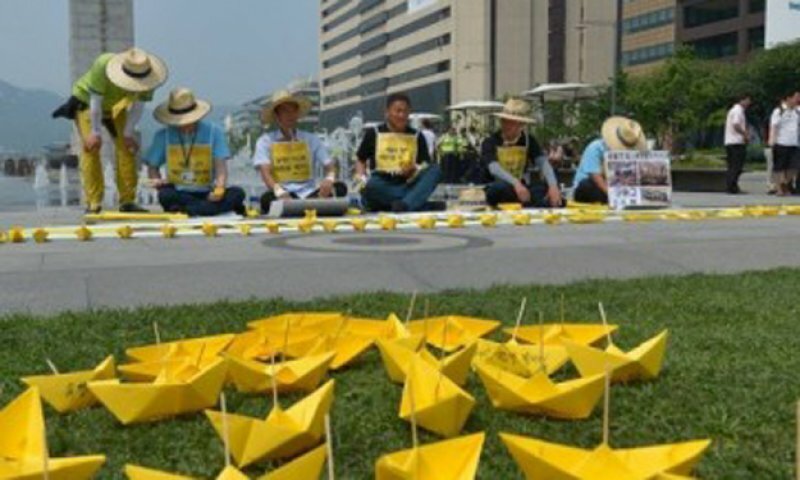 Seoul (AsiaNews) - After 46 days on a hunger strike and following his hospitalisation in critical conditions, Kim Young-oh (father of a Sewol victim) said he would stop his protest because his daughter asked him. "I want to stay alive to keep fighting," he explained. Kim, 47, lost another daughter in the Sewol disaster on 16 April and began his protest action to get the government to launch a serious investigation and adopt a law to punish the culprits. After he stopped, hundreds of people came forward to take his place. Up to 250 South Koreans are currently fasting in order to obtain truth and justice. On 16 April, a ferry carrying more than 300 passengers sank on its way to Cheju Island. Most of the victims were high school students on an outing, including Kim's 17-year-old daughter Yu-min. After the incident, the government adopted a law to find out what happened and who was responsible, but for victims' families it was inadequate and thin. In fact, the law fails to lay out charges, look at the responsibilities of the Coast Guard or government officials, and finds extenuating circumstances for the crew. After more than four months, it is still unclear why the ship sank. According to relatives, who set up a committee in May, politicians want to protect themselves and the shipping industry. For this reason, they want a new law and began to protest downtown Seoul. Their tents spread over Gwanghwamun Square, and during Pope Francis' visit to Korea, demonstrators were able to meet the Holy Father. Kim gave the Pope a pin shaped like a yellow ribbon, the symbol of the protest, which Francis wore on his mozzetta throughout the apostolic visit. Political parties met yesterday to try to find an agreement, but the meeting ended in a stalemate. The Democratic Party and the conservative one, a family member said, seem to agree in wanting to hide the truth. For this reason, the hunger strike continues. Every day some 150 people fast for 24 hours in Gwanghwamun Square, peacefully demonstrating their support for the families. Oh Soon-deok, 77, came from Jeonju without telling her family. "I wanted to physically share in the suffering of the hunger strike. I'm not educated, so I can't express my feelings in words, but the people have a duty to help the families find redress for their wrongs." On Tuesday, Card Yeom met with representatives of the families. Speaking to reporters immediately after, the archbishop of Seoul said dialogue should come first. "I hope our power and energy will not continue to be wasted on this issue," Yeom said. "I think perhaps the victims' families should concede at a certain point." In an editorial, the Korea Herald - and other papers - the cardinal's position was harshly criticised. "Yeom is right in urging everyone to help heal the pain of Sewol disaster," said the article, "and his warning against political exploitation of the Sewol tragedy is reasonable as there are always people ready to exploit a situation for their causes." "However, his remark on the need for the families to concede at a certain point is a little too harsh and unfeeling, especially coming from a clergyman. Instead of healing the families, Yeom has rubbed salt into their wounds." "The yellow ribbon symbolizing support for the Sewol families was pinned on the cardinal's robe but the meaning of wearing the badge appears to have failed to pierce his heart," the paper added.